The hot water circulating pump article provides guidance and review about different types, qualities, durabilities, and prices. Hot water circulating pump is a pump used to circulate the hot water in a closed circuit. It is mainly used in domestic water systems to avoid the water cooling. The water in the hot water system gets cooled down when not in usage for a long time. The cold water gets accumulated near the output of the domestic water supply system. When we turn the water heating system, the accumulated cold water comes through the discharge. Hot water flows only after the accumulated cold water is transferred. The domestic water supply system requires sufficient time before providing the hot water output. The cold water accumulation also leads to the wastage of water. In order to avoid the time lag and water wastage, a pump can be used to circulate the hot water in the system. 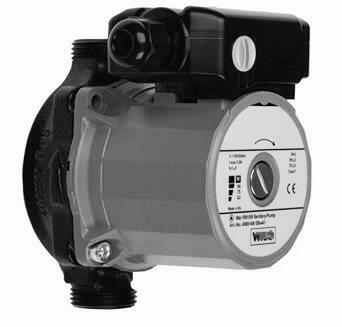 This pump circulates a small quantity of hot water in the system continuously and hot water is made available instantly on turning the system. The hot water flows without any delay or lag, and water wastage is avoided. These pumps are utmost required in places with minimal water resources. Hot water circulating pump must be selected based on the following physical and environmental factors considering their need and application for effective and efficient functioning. Type of pump – Circulating pump can be classified as two types as On-demand circulation pumps and Auto timed circulation pumps. On-demand circulating pumps are operated based on the requirement manually. They operated only at the required time. Auto timed circulating pumps are controlled automatically by an aquastat and adjustable timer. The pump operates automatically by the control system without human intervention. Auto-timed pumps are expensive. Water flow rate - the amount of hot water to be circulated in the system to provide instant hot water supply. The flow rate is expressed in terms of volume per unit time. It is measured in gallons per minute (GPM). Return line – The return line is a piping system through which the cold water is returned to the system from the supply lines. Return lines are required only when the output supply is far away from the pump system. They are mostly not required in the small domestic and home applications. Power – the amount of energy required for the efficient pump operation. The power source is electrical or DC powered by batteries or solar power. The pump is powered by the domestic water supply system itself. Piping– Piping must be selected efficiently to avoid the heat loss during flow. They must be insulated effectively to prevent the heat dissipation and losses to the environment. Supply hot water instantly and eliminates the waiting time. Reduces water wastage to a greater extent. They reduce the water usage in the system. Avoids water stagnation and thereby maintaining the water clean and pollution free. By heating the water to required temperature, the bacteria and other pathogens in the domestic water supply system are killed. Maintenance free and less operational costs. The initial cost of installation is higher than water systems without the circulating pump. Need to avoid the heat loss through pipes due to conduction. They must be suitably thermally insulated. Hot water circulating pumps are mainly used in the homes for hot water supply. Hot water is required for various needs such as washing, bathing, etc. in our homes. They are also used for supply hot water in various industrial applications. Hot water circulating pumps are manufactured by TACO pumps, Grundfos Inc.., Armstrong Pumps, Watts Water Technologies and Bell & Gosset pumps. They can be bought from the e-commerce sites such as Homedepot.com, Amazon.com, eBay.com, Wal-Mart, etc. Their prices vary from 100$ to 1200$ depending on their size, power rating, flow rate, etc. TACO Pumps is one of the leading hot water circulating pumps for the residential and domestic purposes. They have a wide range of products used for various applications for domestic and industrial purposes They provide a complete solution for the water supply system needs from flanges, control panels, motors, cartridges, etc. Armstrong Pumps provide pumps for residential, domestic and industrial needs. They also provide the spare parts for the water circulating system. They provide customized pumps for our specific purposes. Bell & Gosset pumps are mainly used for the water circulation in hot water circulating, ventilation and air-conditioning processes. They are also retail sellers of parts such as bracket assemblies, bearings, baffles, bonnets, flange kits and motors.